1 Place the lentils in a medium pan with the bay leaves and thyme, cover with cold water and bring to the boil over a high heat. Simmer for 15 minutes or until just tender. Drain well. 2 Meanwhile, peel the celeriac and cut the flesh into 1cm cubes. Drop into a large pan of lighted salted boiling water, bring back to the boil and cook for 5–6 minutes or until just tender. Drain well. 3 Place all the remaining ingredients except the rocket into a small food processor and blitz until smooth. 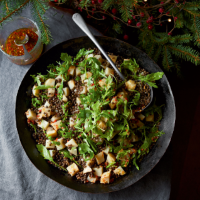 Pour into a large mixing bowl and add the hot, drained lentils (removing and discarding the herbs) and celeriac. Add some seasoning and mix thoroughly. Leave to stand for at least 30 minutes, then stir in the rocket just before serving. Make the salad and leave to cool completely, then cover and chill for up to 24 hours before adding the rocket and serving at room temperature.